Gigabyte reveals the GA-H61MA-D3V rev 2.0, the company's first entry-level $50 board with dual-UEFI BIOS. Full details at TPU, the motherboard will start shipping in May. In Japan, the company released the latest revision of the GA-H61MA-D3V (rev. 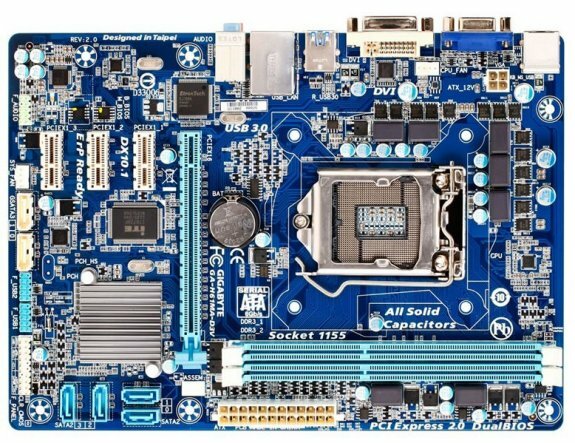 2.0), an entry-level socket LGA1155 motherboard based on the Intel H61 chipset, which features Dual-UEFI. Apart from this, the board also features GIGABYTE's Ultra-Durable 4 Classic component loadout, which consists of a new fiberglass fabric weave PCB that's more resistant to humidity that causes short-circuits, high ESD-resistance ICs, anti-surge ICs located on critical circuits, low RDS (on) MOSFETs, and a 100% high-grade solid-state capacitor design.